Like it or not, the Bible is clear about the events of the end time. They are certain to occur. The reputation of the Apostle John as well as the very words of Jesus assure the reader over and over again of the unavoidable necessity of the events taking place. 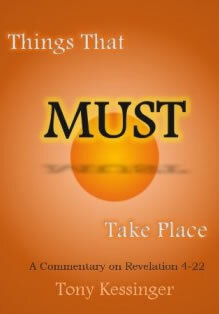 Things That Must Take Place is written from a conservative premillennial perspective. The book examines in detail, from a verse by verse method, Revelation 4-22 and establishes a sequence of events which helps the reader visualize this coming time of unprecedented turmoil. Book Review by Stephen Ruff – Select this pdf file link to read the book review made by Steven Ruff, Senior Pastor of Port Royal Baptist Church in Port Royal, South Carolina. Book Review by Nathan Albright – Select this pdf file link to read the book review made by Nathan Albright from Portland, Oregon. He now lives in Tampa, Florida. Book Review by Lee Harmon – Select this pdf file link to read the book review made by Lee Harmon from Lino Lakes, Minnesota. Book Review by Kirkus Indie – Select this pdf file link to read the book review made by Kirkus Indie.